When I examined the footage of bacterial colonies on the internet, I discovered the work of a professor of physics Eshel Ben-Jacob, as I mentioned on one of side. 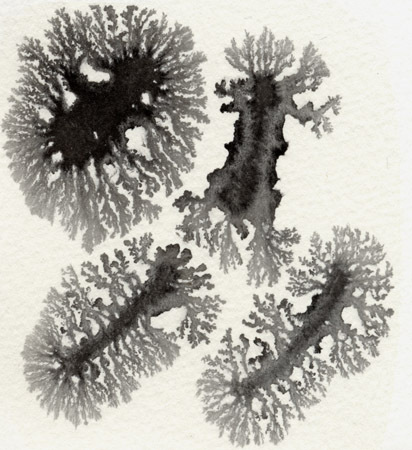 The way he cultivated bacteria and studied their complex patterns, have inspired me to try to work with China Ink, watercolor and Ecoline in a manner reminiscent of cultivation. 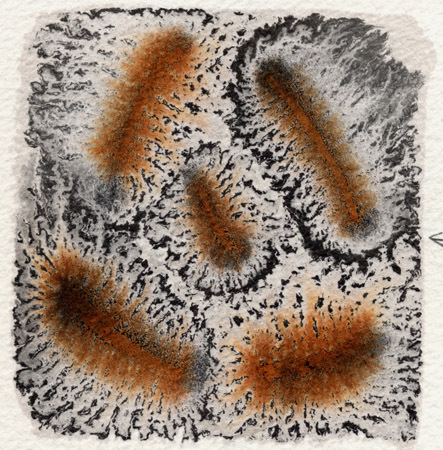 I started experimenting with China Ink and Ecoline because I observed small fractal-like effects in watercolor paintings. These effects could indicate a chemical reaction and I saw potential to enhance the fractal-like visual manifestation by experimenting with the addition of various chemical substances. Process resulted in video and pictures.